It seems all we hear about are the benefits of 3d printing, and how amazing 3d printers can change the world. They can print incredibly complex models that would be almost impossible with standard manufacturing techniques. They will bring about massive customization by consumers. To peek at the other side of the coin, the Innovation Investment Journal produced a good outline of what 3d printers are bad at. Their report can be boiled down to three main deficiencies. Current 3d printers take a long time to print a model. It takes time for each layer to cure or harden, and if you want good prints, each layer needs to be placed perfectly. This is the core complaint, and leads to other shortcomings. Volume production should not be done with 3d printers, as they’re too slow. Even expensive 3d printers still can’t match traditional manufacturing, and the throughput per machine is low. Because they’re slow, printing large items is time-prohibitive with 3d printers. 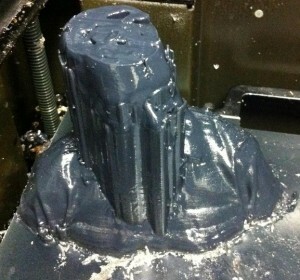 The consumer grade 3d printers we’re seeing exploding onto the market are low resolution and hard to calibrate. Even more expensive consumer level products show layering lines, and a molded plastic will give better results. The surface finish of all but the highest end printers shows irregularities and printing artifacts. Moving parts are difficult, if not impossible for most printers. High end printers may be able to, but most 3d objects are boring or knick-knacks because of the quality and capability limitations. Most 3d printers only print plastics. The durability of the 3d printed plastics is low, and microscopic plastic bits can break off with use. The plastics have low tensile and compressive strengths, melt at low temperatures, and have poor chemical resistance. Alumides are a poor substitute for real metal. Stainless steel 3d printers don’t produce food safe metal prints, and is nowhere near replacing machined metals. Only extremely expensive machines like the M2 Cusing can produce high resolution prints with metal, and we don’t yet have detailed studies of the material properties of the resulting print. As we’ve seen with the recent innovations with 3d printing, this is a new technology and still rapidly evolving. Perhaps advances in materials used for 3d printing will give us faster prints. Maybe a complex print head that heated what was right below it then chilled it after printing would work faster. Maybe multiple independent print heads? Possibly stereolithography of resin, like the Form 1 could be done at higher rates. There will always be a speed/quality tradeoff, but in the short term, we’ll see printers push what’s possible on both fronts. New advancements in sintering technology will drive the cost of metal printers down from their current prices of $500k -$1 million to more reasonable levels. They won’t be affordable for consumers, but 3d printer service companies will provide access to the high resolution machines with lower investment. We don’t critique a George Foreman grill because its throughput can’t support a whole McDonalds restaurant, but the report seems to critiquing entry level consumer grade 3d printers for not having the high resolution and material options of industrial printers. 3d printing is not yet a mature technology. It has decades of growth and improvements ahead of it. Improvements on all fronts will drive costs down and quality up. The main problem with 3d printing at this point is too much hype from journalists that want a flashy story about the latest technology. They want their future, and they want it now.